» Bhim Army Chief Urges Dalits to Stay Away from Ram Temple Movement. In a press conference in New Delhi, the Bhim Army chief threatened to enter Ayodhya to remind the administration of its constitutional duties. This comes at a time when the people in Ayodhya and its surrounding areas are in the grip of tension, fearing an outbreak of communal violence in the backdrop of massive mobilisation of Hindutva cadres by VHP. A Groundxero report. 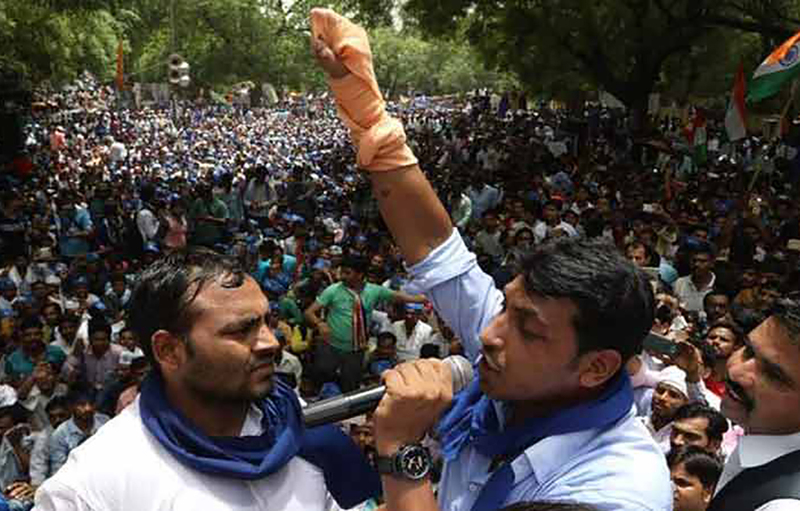 The Bhim Army chief, Chadrashekhar Azad, held a press conference in New Delhi on Sunday, where he declared that he will enter Ayodhya on Monday, 26th November with a copy of the Indian Constitution. Azad said that he would meet the District Magistrate and present him with a copy of the Constitution to remind him of his constitutional duties. Azad’s plan to head to Ayodhya comes at a time when the entire town and its surrounding areas are in the grip of tension, fearing an outbreak of communal violence in the backdrop of massive cadre mobilization by Vishva Hindu Parishad and Shiv Sena to push for construction of a Ram Temple at the Babri Masjid site. The VHP, an ultra-Hindutva outfit, will organize a ‘Dharma Sabha’ in Ayodhya from Monday. The Bhim Army chief further alleged that a conspiracy is being hatched and questioned why the VHP is organizing its Dharma Sabha on 26th November, which is celebrated as the Constitution Day. “By allowing the communal forces the Government is deliberately disrespecting the Constitution. The Bhim Army will not allow it,” he said. He also renewed the Bhim Army’s demand of a Buddha Temple at the disputed site. “The original name of the city was Saket, not Ayodhya. It should have a temple of Lord Buddha,” Chadrashekhar said. This move by the Bhim Army chief assumes political significance at a time when most of the so-called secular mainstream political parties are silent and judging the prevalent mood instead of coming out strongly against the Hindutva forces brazenly challenging the constitutional authority of the Supreme Court, which is scheduled to take up the matter in January.